With years of development in LED component field, Lite-On has had its place in the market. 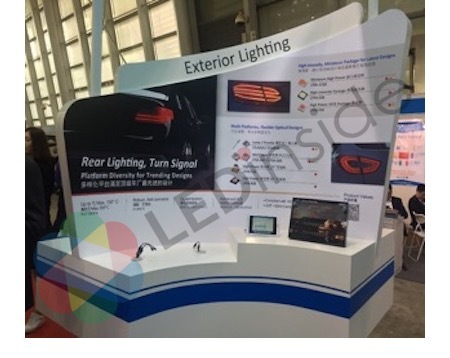 Themed on “Our Profession, Your Brilliant” this year, Lite-On exhibits full series of automotive LED, sensing products and solutions at 2018 ALE (exhibition booth: T238) as it aims at front lighting, tail light, interior lighting, smart sensor and other applications based on the automotive hardware design trends. For many years, its Optoelectronics Business Group has been dedicated to grasping new automotive design trends, understanding customer demand, and assisting customers in creating excellent value through providing high-performance, high-quality products and flexible, customized services. 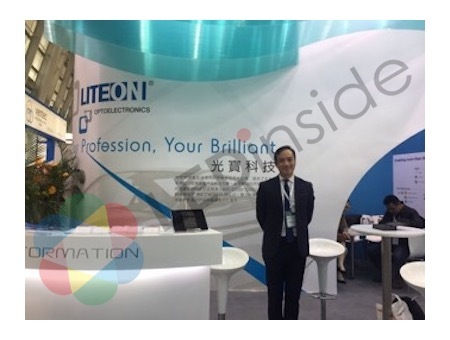 LEDinside has the chance to interview the senior director of the global marketing division and the New Product Division of Lite-on's Optoelectronics Business Group, Su Yuhong, who shares the business operation and future strategy of Lite-on. Su Yuhong expresses that matrix LED headlamp is the new-generation automotive lighting technology as AFS has been the mainstream of automotive lighting. Lite-on's HxS series products adopt multi-chip technology. Each chip can be driven independently. The products have many advantages such as high reliability, high luminous efficiency, high color uniformity, high color temperature consistency and low thermal resistance, which is helpful for automobile manufacturers to develop innovative LED headlights with dynamically changed beam pattern and intensity, and then to achieve optimal road lighting and provide better safety for drivers. In addition, its small-sized medium- and high-power LEDs 2720 series (2.75*2.0*0.6mm) and dual-chip H2D series (3.1*3.75*0.75mm) are available in various specifications for customers’ flexible operation. The flexible product portfolio is applicable to new design trends like daytime running lights, integrating turn signal or fog lights. Moreover, Lite-On's LEDs for front lighting have a temperature resistance of up to 150°C, also qualified to the latest AEC qualification standard (AEC-Q102) , which are ideal option for automotive front light LED. In recent years, tail light has developed from signaling towards vehicle design, and the through-type streamlined tail lamp will lead the new visual trend of vehicles. In addition to the " silver-free LED" E67/G6S series, Lite-On also introduces dome lens series like C36 and R38, providing small-angle optical solution that enables customers to develop and design more flexible. With high anti-vulcanization performance, its rear lighting products adopt advanced thermal management and packaging technology, achieving working temperature up to 110°C, high reliablity and excellent optical performance, which are the best choice for real lighting LED. In interior lighting filed, smart lighting is prevailing, not only providing drivers with a variety of lighting colors, but also being able to adjust the cabin atmosphere on their own to optimize the driving experience in the car. Lite-on’s multi color 3-in-1 top LED G683 (3.5*2.8*1.45mm) and multi color 3-in-1 side LED S008 feature with highly compact package (4.5*1.25*0.8mm) and high luminous efficiency, which provide excellent RGB color mixing and unique atmosphere. Lite-On interior lighting solution provides the right LEDs in all relevant performance classes and package sizes, cover the complete brightness range, colors and even colors on demand. 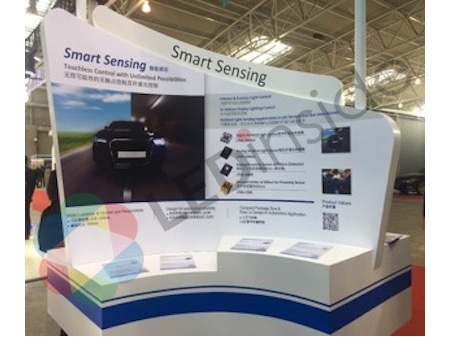 Currently, the connection of smart sensor with Human Machine Interface (HMI) not only provides convenient and quick user experience, but also can effectively improve the safety of driving. 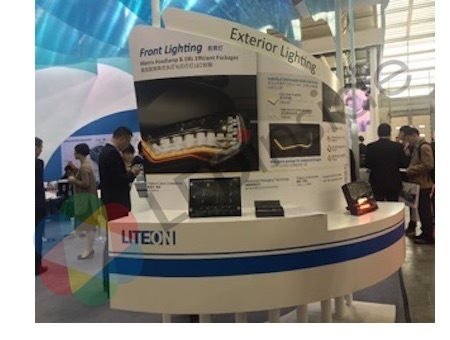 In recent years, Lite-On has been actively developing intelligent sensing devices, and integrating with IR emitter, which is the new trend of Lite-On's products development. 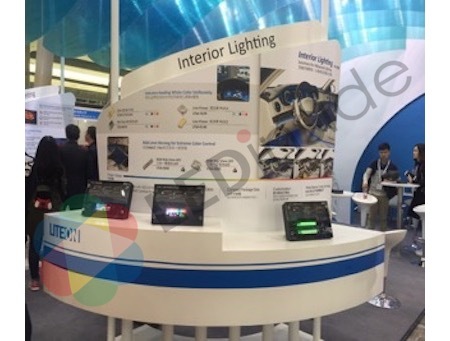 At 2018 ALE, it showcases automotive-grade ambient light sensors and proximity sensors simultaneously, the ambient light sensor (LTRA-300ALS) has been favored by the industry and top-tier car makers for use in automotive interior light sensing and head-up display, greatly enhanced the visibility of dashboard information.